Like a good portion of the Eastern United States, I am sick of winter and need warmth. Doesn’t that picture above look cozy and inviting? So let’s head to the Sunshine State this month for our featured stadium. That arena in the image is the Jacksonville Memorial Veterans Arena, a building that many don’t know exists thanks to the lackluster list of tenants. Despite being part of the 40th sized market in the country, the Sharks of the Arena Football League are the main draw in the 12-year old facility (along with Jacksonville University Basketball). With 13,000 – 14,000 seats for sporting events, it does fit the mold quite well for the NCAA Basketball Tournament’s opening rounds and in a few weeks, the Populous designed arena will play host once again. 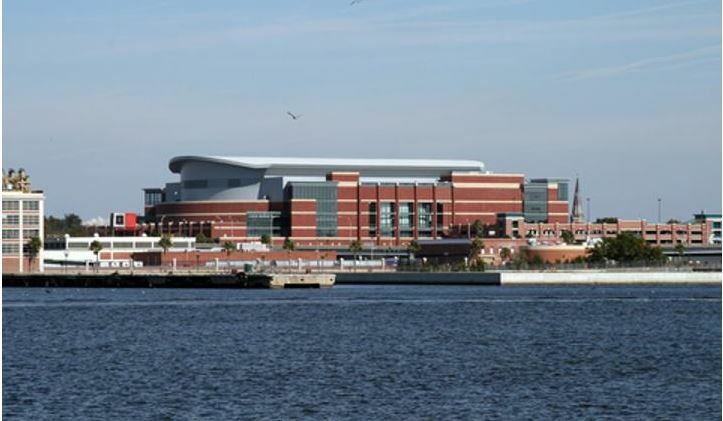 The arena, along with the ballpark, was a part of an improvement plan for the city and this complex of sports venues (along with EverBank Field) makes up the east end along the St. James River. It may look and sound nice, but there is no real reason to explore the immediate area before the game. In fact, Jacksonville is not exactly at the top of tourism lists in Florida (one person who went to the Super Bowl several years back described it as a “hole” to me), but the arena is a different story. The brick building with aqua accents is warm on the eye. Starting with a nice impression is the Hall of Fame found near the front entrance, where various displays of memorabilia shape the story of Jacksonville’s sporting history. Inside is an arena compromised well between modern-day luxuries and the common fan. Sitting steeply above a row of luxury suites on the side is a 300 level that is closer to the court than normal due to the arena’s relatively smaller size. While the city may not be a great destination for an NCAA weekend, check out a Sharks game. They pack the place pretty well and the season starts April 3.